Filters: Using quality air filters means you will never have to sacrifice clean, healthy air. Cascade Heating & Specialties has a large selection of HVAC air ﬁlters for both residential air conditioning and commercial air conditioning. Shop by air ﬁlter brand, air ﬁlter type, size, thickness or performance rating. We carry the most popular brands. We even carry hard-to-ﬁnd custom air conditioning ﬁlters. Because there are so many types of air ﬁlters available, selecting the right one can feel overwhelming. ​If you need assistance, the knowledgeable associates at Cascade Heating & Specialties can help you decide which air filter meets your individual needs. ​Cascade Heating & Specialties is your one-stop for all air ﬁltration needs. If we do not have your particular ﬁlter in stock, we will order it for you and have it the next day. Call: 541-382-8483. Changing your air filter is important because a clogged air filter can not only damage your heating and cooling system, but it can put off unhealthy air. A clean air filter will purify the air and keep your system running for a long time. 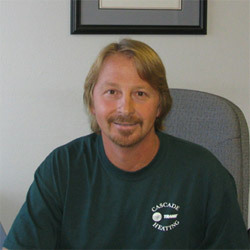 My name is Joe Heiberger and I have been in the HVAC Industry for over 15 years. I started out in the Architectural Sheet Metal Dept. then moved on to the Residential Dept. here at Cascade Heating. With a long history of inventory control and purchasing, I have since moved into position of Purchasing Agent/Parts Manager here. This involves orders of all equipment and materials for the company, while also maintaining our parts and warehouse supplies. ​In my spare time I enjoy golfing, outdoor sports, and hiking the many trails offered in Central Oregon.